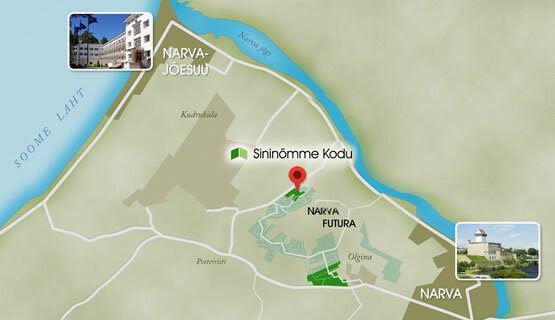 Sininõmme is a modern garden city located between Narva and Narva-Jõesuu, with residence and rest awaiting people who value nature and quiet. 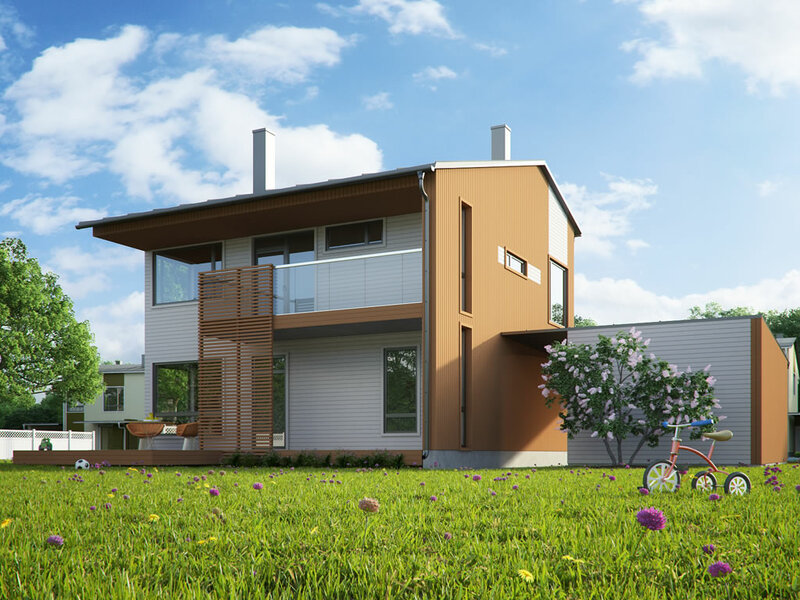 Sininõmme is a wholesome living environment where modern buildings stand beside parks and recreation areas and where a kindergarten and playgrounds are planned. 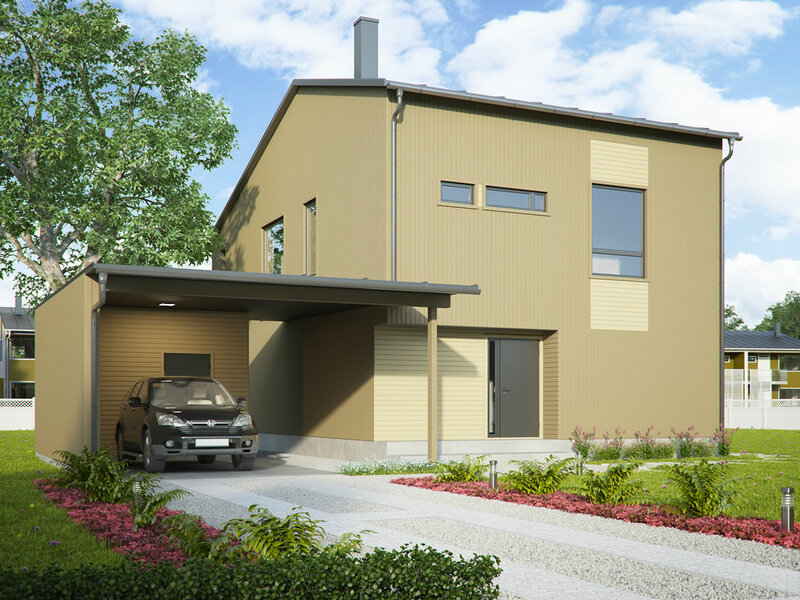 The residential area with modern planning that will be created at Sininõmme in a few years is a separate green garden city with convenient access to Narva for work and business and to Narva-Jõesuu for a seaside holiday. 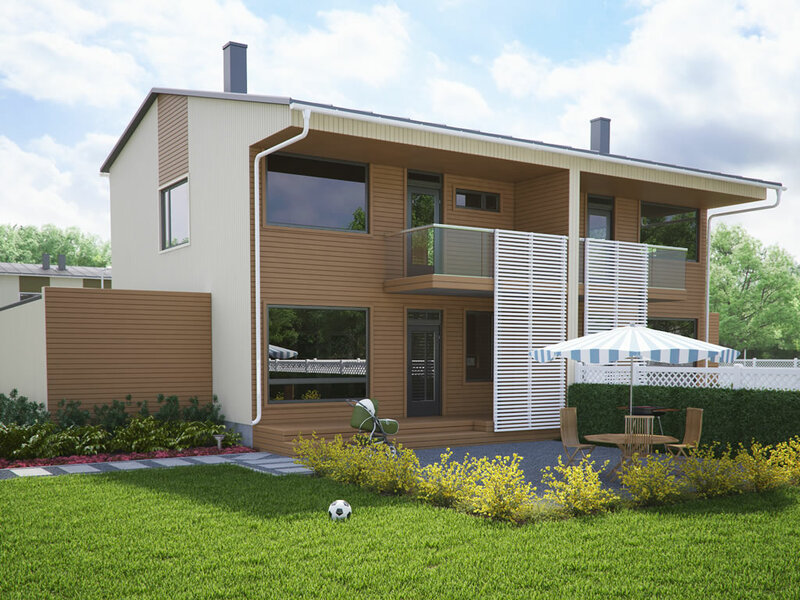 The centre of the residential area houses a park forest with natural beauty, together with recreational areas and walking paths; Tõrvajõgi River flows though the settlement and its banks will be kept open for walkers. In the future, a 14 km long well-lit health and sports trail will be constructed in immediate vicinity of Sininõmme, to connect Narva and Narva-Jõesuu and to extend the recreational and sporting opportunities even more. All utilities needed for the residential area (roads and street lighting, electricity, gas and water supply, sewage, storm water sewage) will be constructed as a unified system. Sininõmme Village is one of the oldest Estonian settlements; already our ancestors considered Sininõmme the best place to live around Narva. 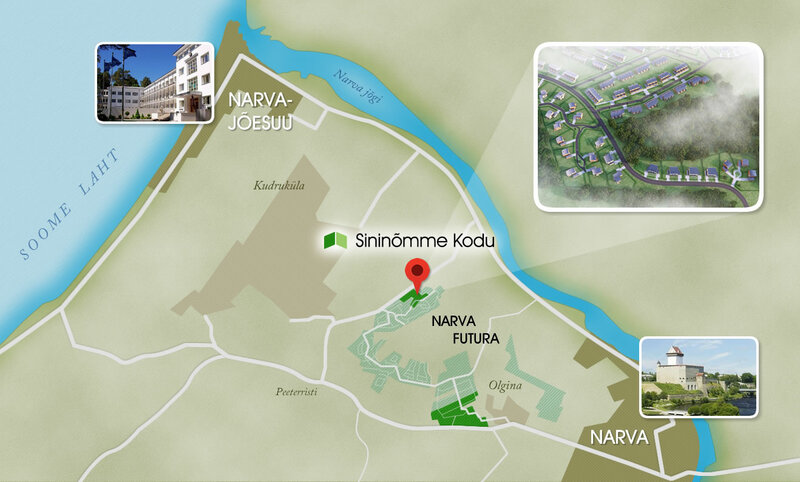 Today, Sininõmme is a part of the Narva Futura living and business environment being constructed to encompass the region between Sininõmme and the city of Narva. The goal of Narva Futura is to build a wholesome modern city environment: the area is planned to have sections for small residences, apartment blocks, business and trade, and the centre of the future city space. 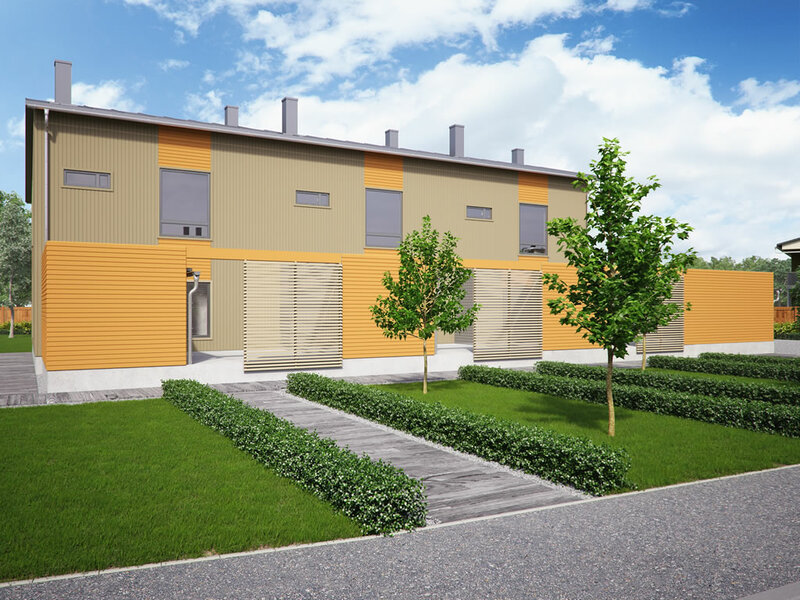 By now, stage I of Narva Business Park is completed of the project. The residential quarter comprised of residences with similar architecture is located along the Peeterristi-Kudruküla road, in Tõrvajõe Village, Vaivara Municipality. 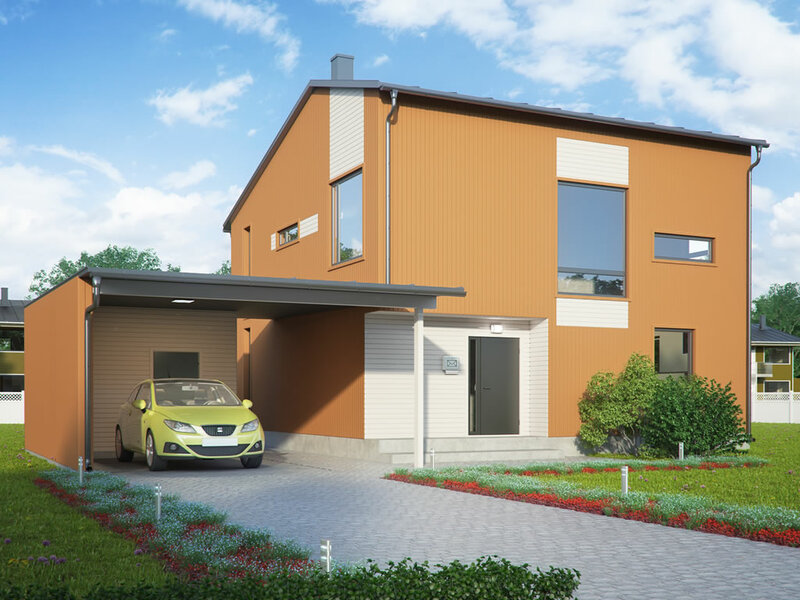 The chosen location is convenient for both car owners and people using public transport; there is good bus connection with Narva and bus stops are located both in the centre of the area and along the road at the entry into the village. Sininõmme will have streets with good pavement; the roads leading to Narva and Narva-Jõesuu are also in good condition. 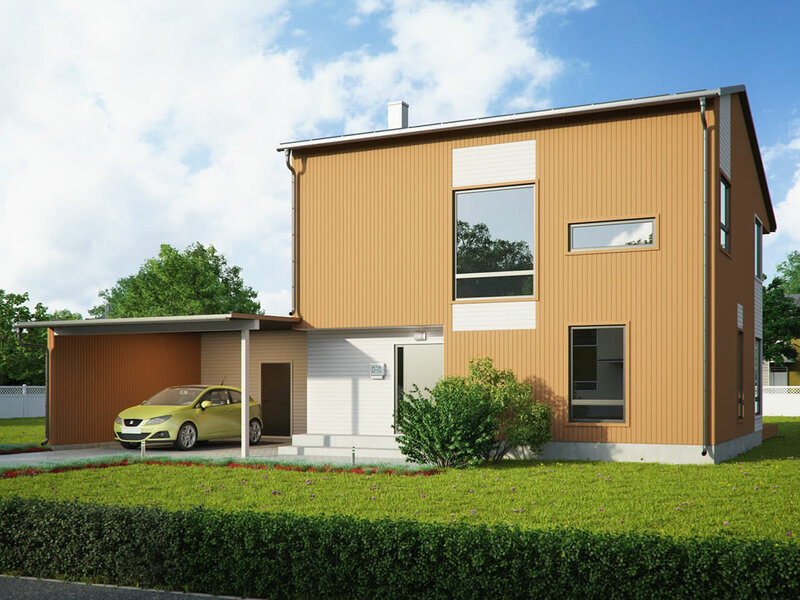 The first phase will see grounds on Sinimetsa, Valgepaju, and Jalaku streets be put on sale. The sizes of the grounds range from 1011 m2 to 1342 m2. 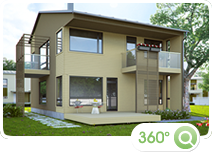 According to the valid building plan, up to 3 buildings with a base surface area of 300 - 360 m2 (depending on the ground) can be built on the ground. The buildings can be up to 2-storey, with the height limit of the main building set at 9m and the supporting building at 4m. 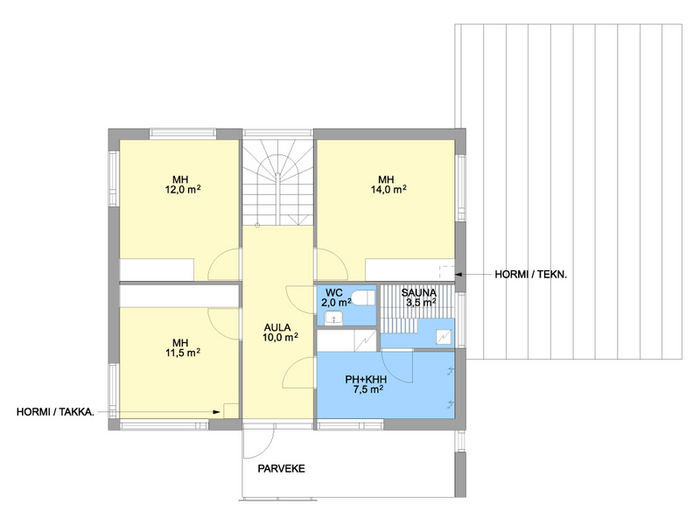 More detailed information on the Sininõmme building plan can be viewed on the building plan certificate . The price of the ground includes connections to the water and sewage lines as well as gas pipes and rain water drainage lines. The price also includes signup to the yet to be built electrical circuit and access roadways as well as VAT. 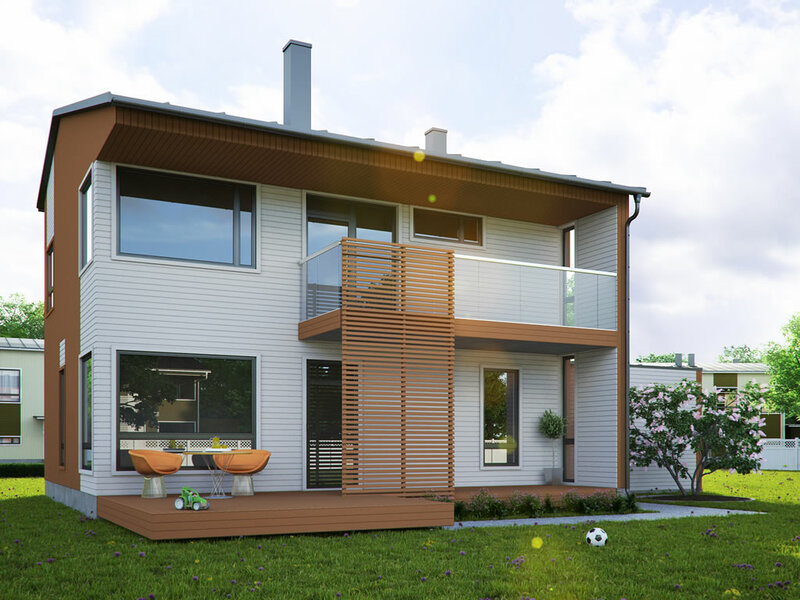 In addition to just buying the ground, there is a possibility to order houses designed for Sininõmme residential district. 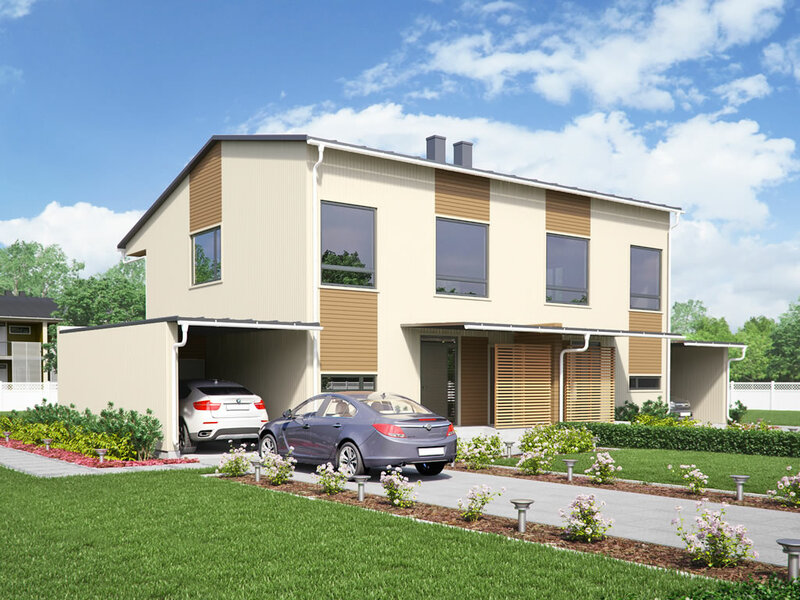 For detailed information please click on the land plots! in a way that avoids disturbing the privacy of neighbours but allows remaining close to them if needed. The house is situated in the front part of the built-up area, at the same line with other residences on the street. 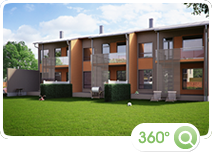 The land plot is accessed directly from the street; the layout of the buildings and the parking space leaves most of the land plot as greenery for the residents’ use for resting and other purposes. The land plots are surrounded with perimeter fences. 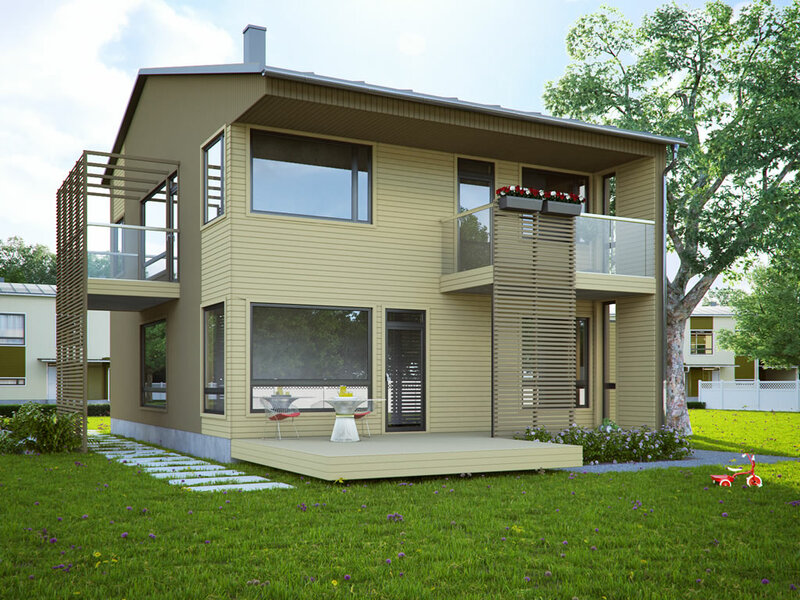 The construction material is wood — a healthy and human-friendly material. 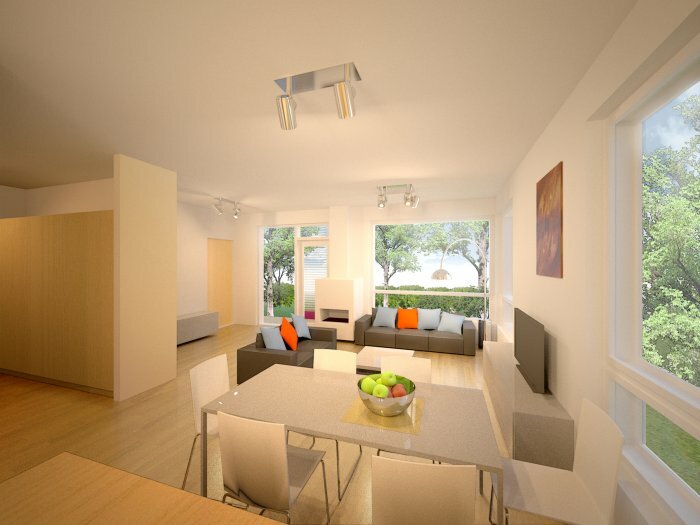 Thanks to a modern room planthe living space is spacious and well lit. 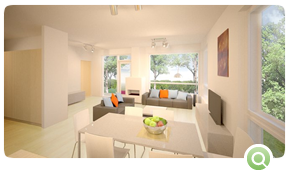 A carefully considered layout of the building helps keep the household costs down. Read more about the offered buildings below. 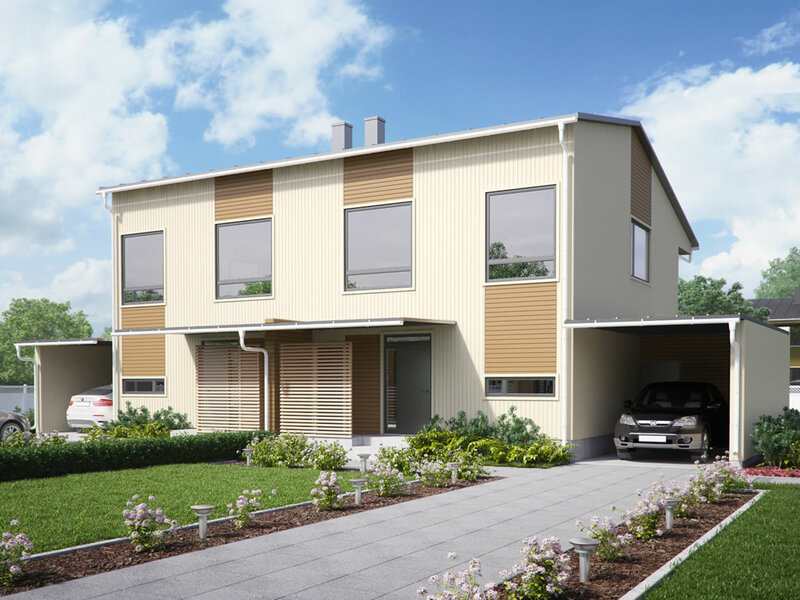 Stockholm is a twin house with two apartments, each having 141.0 m2 of overall space; it is a wooden building with a simple rectangular shape, 2 storeys, a low gable roof, and a wooden façade. At the street side, the façades are enlivened by free window placement, an entrance awning, steps and lattices, and varied façade materials in two main colours. The courtyard side is made lighter by a roof console, balconies and horizontal lattices reaching down from them. 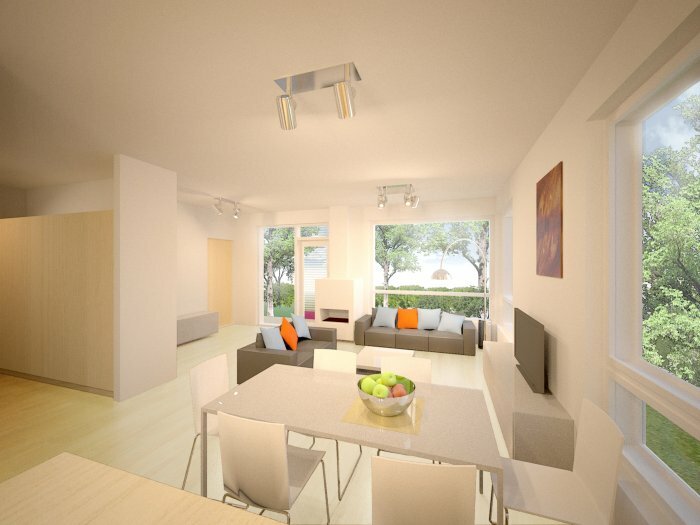 Both apartments involve two storeys. 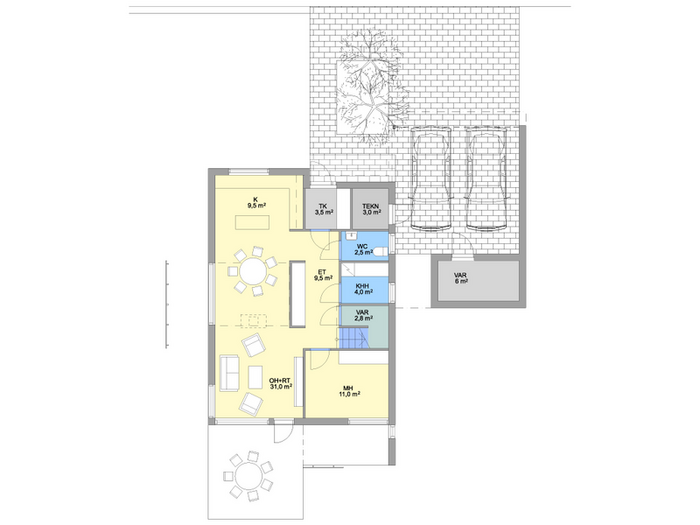 The first storey houses a kitchen and a living and dining room as living space, and a storm porch, a joint toilet room / housekeeping room, an entrance hall and a technical room as other space. 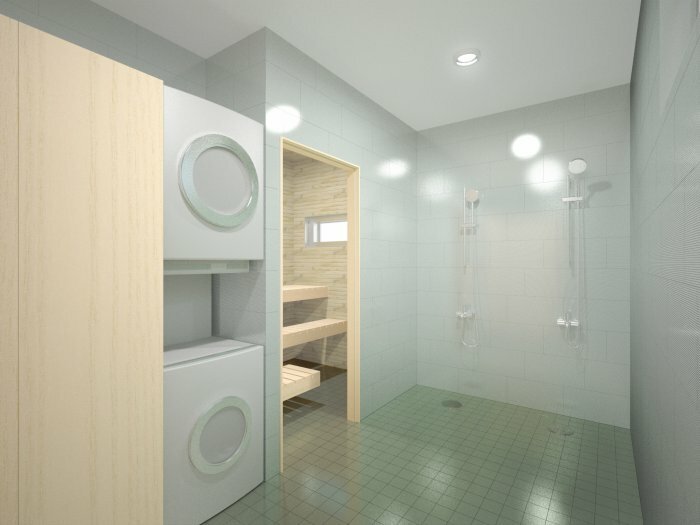 The second storey houses three bedrooms as living space, and a hall, a washing room, a sauna and a toilet room as other space. The storeys are connected by stairs. The first storey is connected to a carport and a courtyard terrace. The carport is connected to an unheated storage place. The largest bedroom on the second storey has access to a balcony overseeing the courtyard. 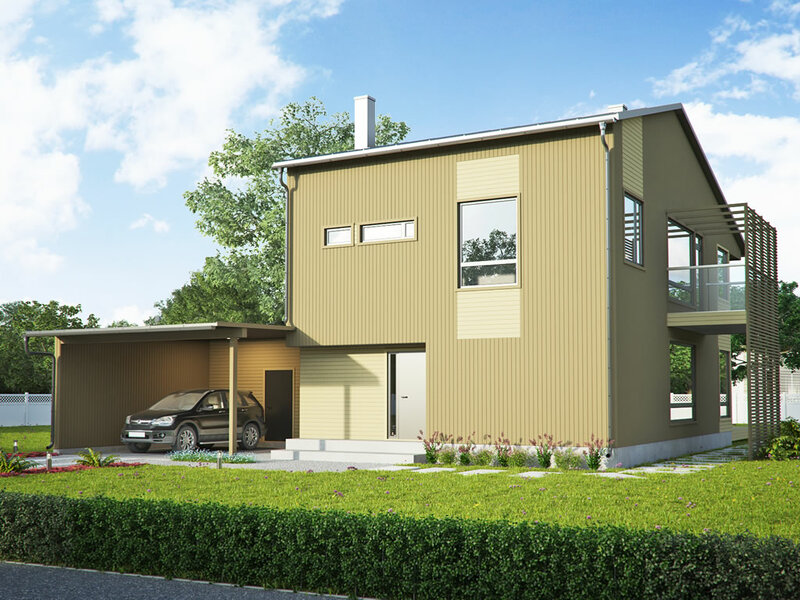 Oslo is a residence with 195.3 m2 of overall space; it is a wooden building with a simple rectangular shape, 2 storeys, a low gable roof, and a wooden façade. At the street side, the façade is enlivened by free window placement, a partial façade recess above the entrance, and varied façade materials in two main colours. The courtyard-side presence is made lighter by a console eave cover, balconies and horizontal lattices reaching from the balconies to the front of the terrace and the dining room window. 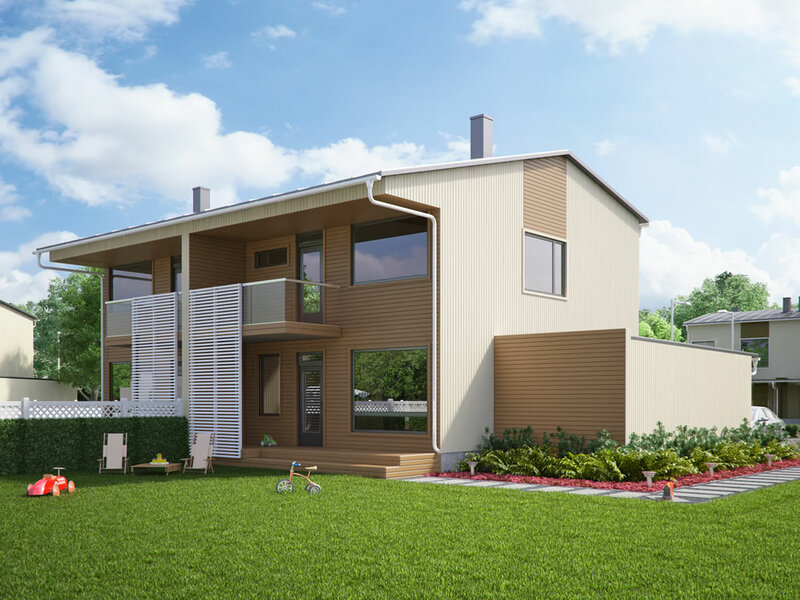 The first storey houses a kitchen, a living room, a dining room and a bedroom/office as living space, and a storm porch, an entrance hall, a storage room, a housekeeping room, a toilet room and a technical room as other space. 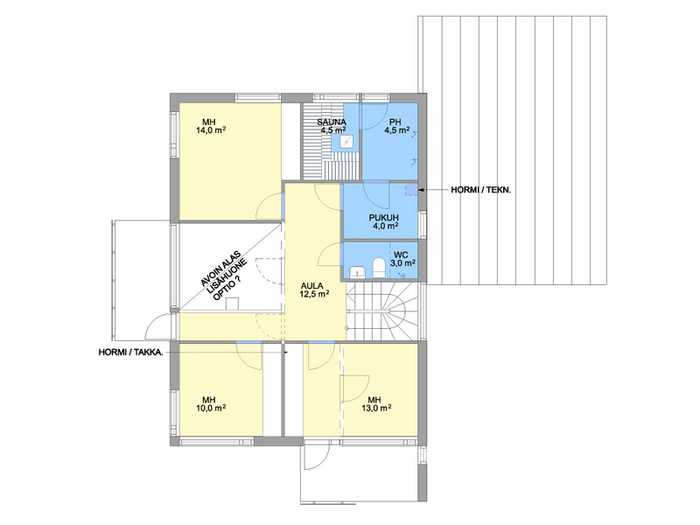 The second storey houses three bedrooms as living space, and a hall, an intermediate room, a washing room, a wardrobe room, a sauna and a toilet room as other space. 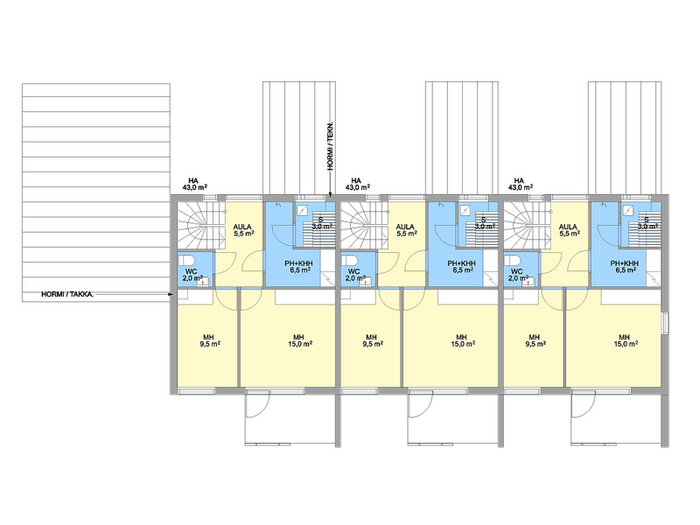 The first and the second storey are connected by an open space which is located above the first storey’s dining room and can be made into an additional second-storey bedroom. The storeys are connected by stairs. The first storey is connected to a carport for 2 cars, and a courtyard-side terrace. The carport is connected to an unheated storage place. 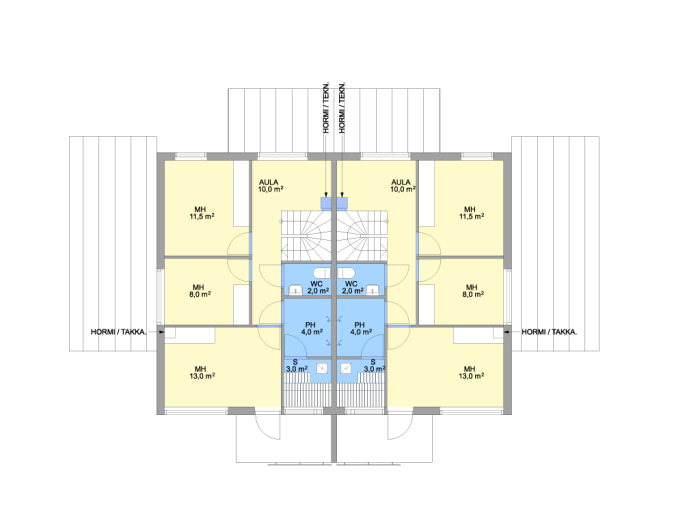 The second storey hall has access to a balcony overlooking the side area, and the intermediate room has access to a balcony overlooking the courtyard. 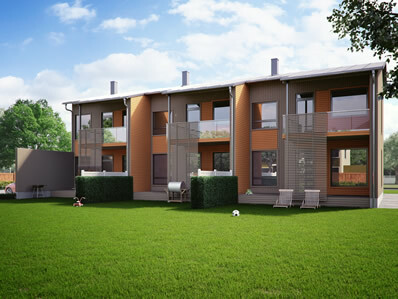 Helsinki is a row house with one to three apartments having 117.3 m2 and two apartments having 119.3 m2 of overall space; it is a wooden building with a simple rectangular shape, 2 storeys, a low gable roof, and a wooden façade. 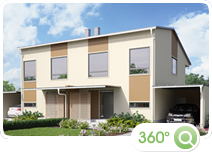 At the street side, the façades are enlivened and made lighter by lower unheated storage places. The carport is located at the building’s end as seen from the street side, and has similar style to the storage places. The storage places are connected by a horizontal beam carrying hanging horizontal lattices which enlighten the street-side façades. Narrow vertical windows balance the building’s overall horizontal look. The courtyard side is enlightened by balconies, horizontal lattices reaching down from them, and an inter-terrace wall between apartments that turns to balcony awning consoles. 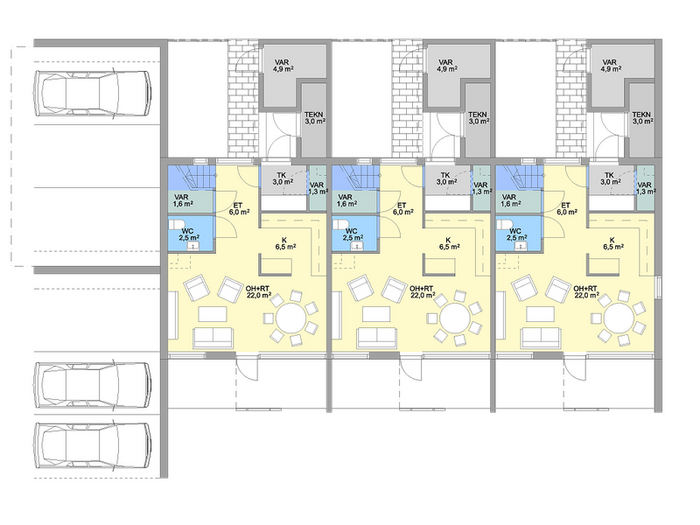 All apartments involve two storeys. The first storey houses a kitchen and a living and dining room as living space, and a storm porch, two storage rooms, a toilet room and an entrance hall as other space. 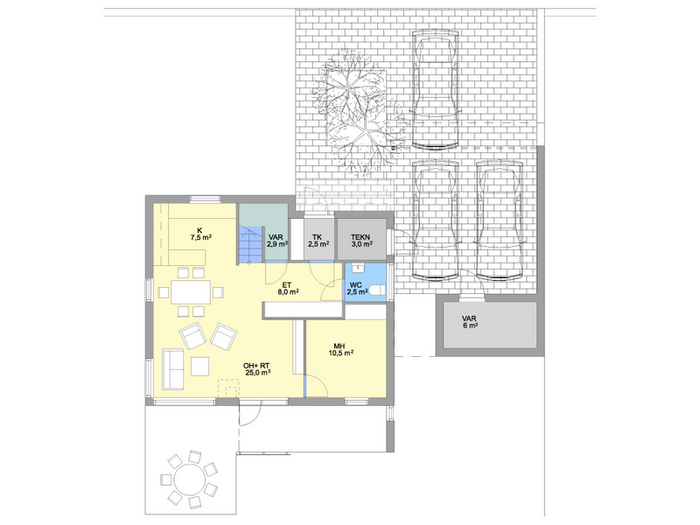 The second storey houses two bedrooms as living space and a hall, a joint washing room / housekeeping room, a sauna and a toilet room as other space. The storeys are connected by stairs. 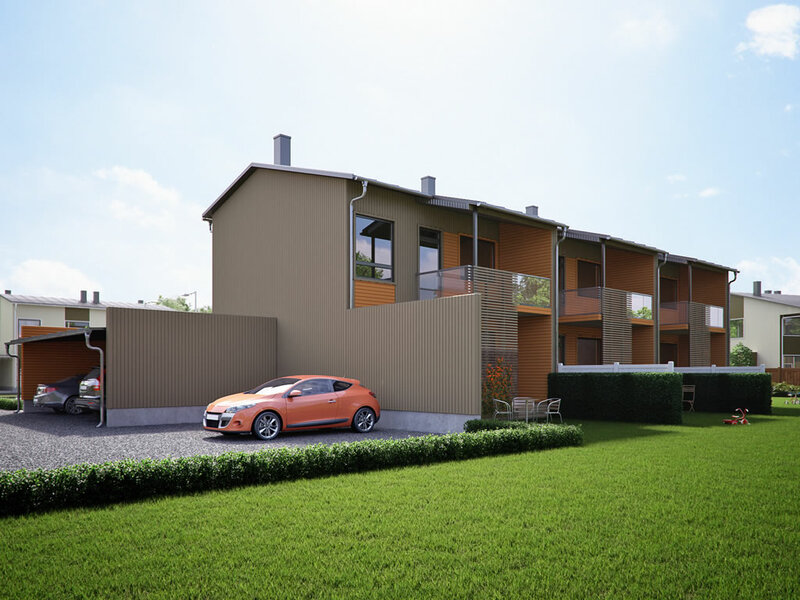 The building’s side has a joined carport with parking space for each apartment, plus parking spaces beside the carport and terraces at the courtyard side. The building’s front side has an unheated storage place connected to the carport, and a technical room. The largest bedroom on the second storey has access to a balcony overseeing the courtyard. Kopenhagen is a residence with 161.6 m2 of overall space; it is a wooden building with a simple rectangular shape, 2 storeys, a low gable roof, and a wooden façade. At the street side, the façade is enlivened by free window placement, a partial façade recess above the entrance, and varied façade materials in two main colours. The courtyard-side is made lighter by a console eave cover, a balcony and a horizontal lattice reaching from the balcony to the front of the terrace. 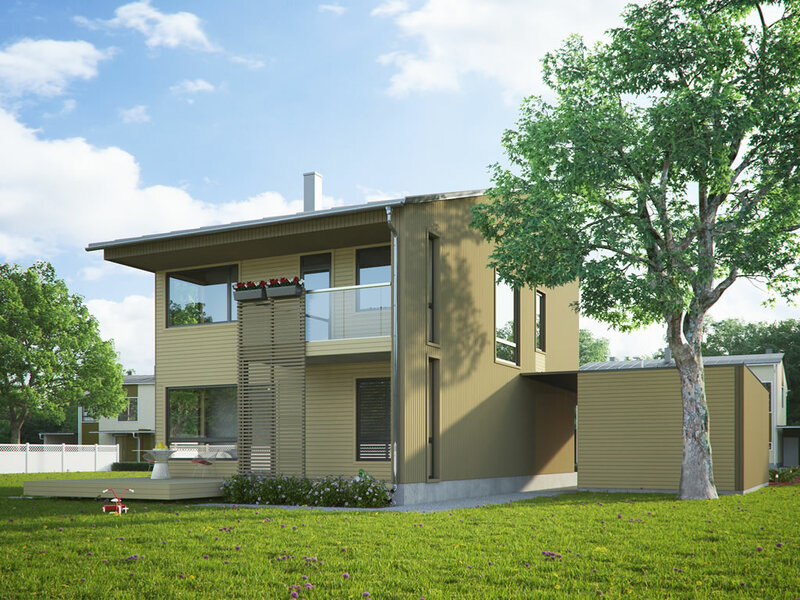 The first storey houses a kitchen, a living room, a dining room and a bedroom/office as living space, and a storm porch, an entrance hall, a storage room, a toilet room and a technical room as other space. 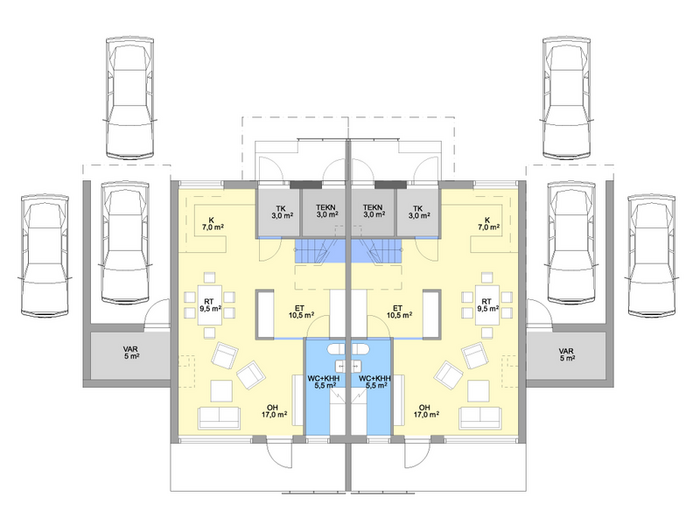 The second storey houses three bedrooms as living space, and a hall, a joint bathroom / housekeeping room, a sauna and a toilet room as other space. The storeys are connected by stairs. The first storey is connected to a carport for 2 cars, and a courtyard-side terrace. The carport is connected to an unheated storage place. The second storey hall has access to a balcony overlooking the courtyard. All buildings have a Class B energy label. The buildings’ foundation is a combined band and plate foundation. 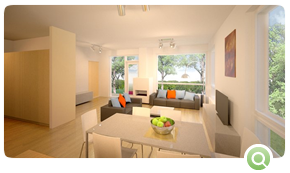 Walls are made of wooden frame and 250 mm of mineral wool as insulation inside the frame. The walls are covered with boarding on the outside and gypsum board on the inside. 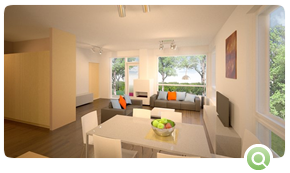 The walls between apartments in twin houses and row houses are double-layered to ensure good sound insulation. The roof structure has wooden trusses with 350 mm of bulk wool between them. The roof covering is high-quality rolled sheet steel. 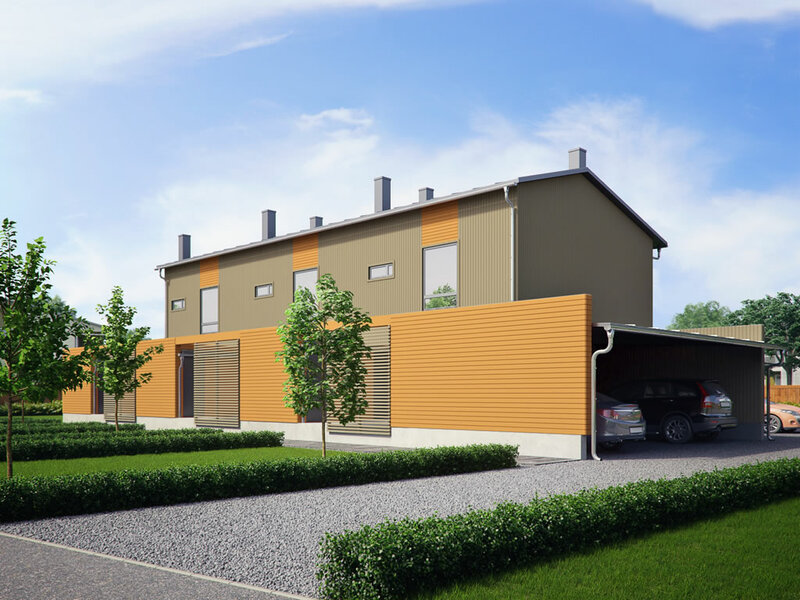 The heating source is a local gas boiler in every building’s technical room; the first storey has floor heating, the second storey has convection radiators. Humid rooms also have electrical floor heating. 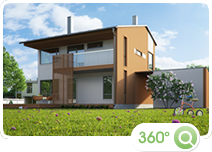 Ventilation has heat recovery; air is supplied to bedrooms and the rest of living space, and extracted via kitchen extractor and from humid rooms, with adjustable power. All buildings are connected to central water supply and sewage network. 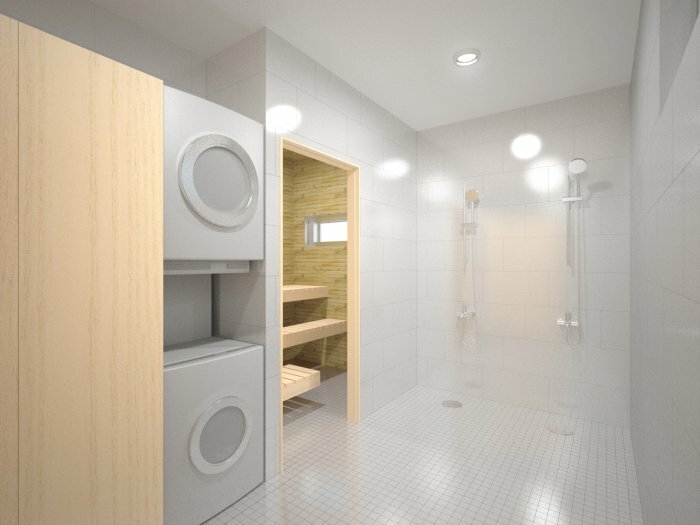 Gustavsberg ARTIC series toilets and sinks and Hansgrohe TALIS E series mixers and shower heads are installed. Connections are available for a washing machine and a dishwasher; the courtyard has an outdoor valve for irrigation water. There is a sufficient number of power outlets installed. All land plots except Helsinki have a white wooden picket fence at the street side, with a car gate and a wicket gate. The other three sides of the land plots have low hedge, and a metal mesh fence at the border of the residential area. There are also short hedges separating the courtyards of twin houses and row houses. Access roads are paved with asphalt up to the land plot border. Driveways, walkways and squares within the land plot are paved with concrete tiles. The parking spaces beside the carports of row houses are established on lawn reinforced with plastic mesh. The ground around the buildings is levelled; fertile soil is installed and lawn is sown. 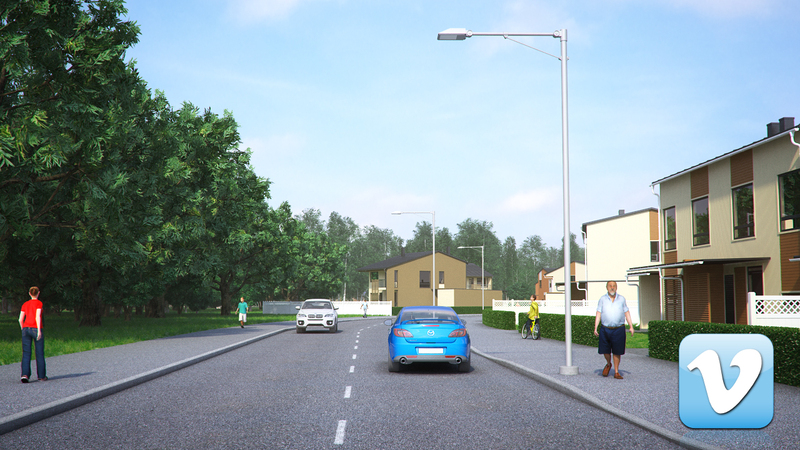 Additionally, asphalt-paved driveways and roads for walking and cycling have been constructed, together with street lighting and park grounds.. Exterior finishing is designed by the architect, using high-quality, durable materials and paying attention to harmony. The boarding is painted in different colours. The roof, outside window frames, eaves and other metals structures are painted dark grey (RAL 7024); the building's socle is plastered and painted dark grey. 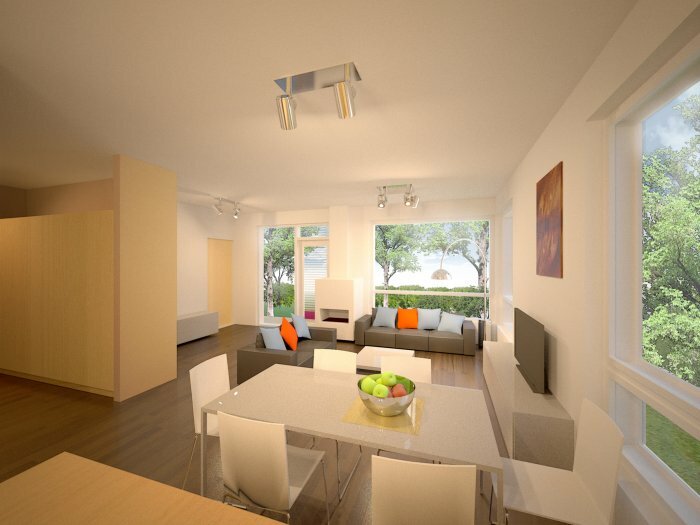 The future homeowner can choose between three interior design packages. Walls are painted in living space and tiled in humid rooms. Floors are finished with high-quality laminate parquet. 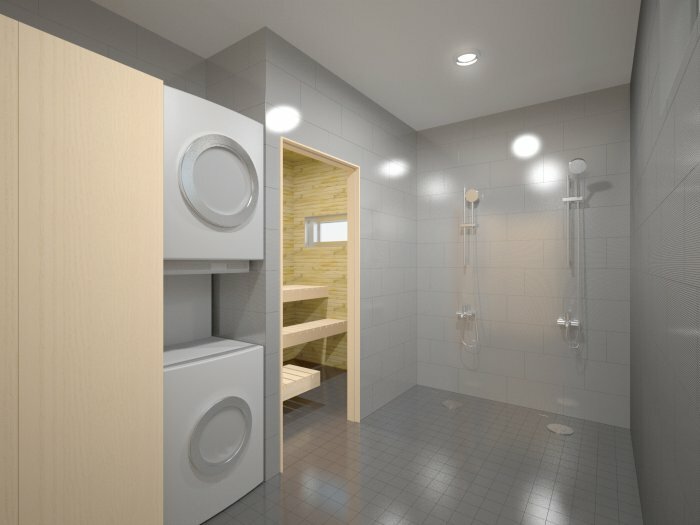 In kitchens in front of the cooking area, in toilet rooms, housekeeping rooms, washing rooms, entrance halls and storage rooms the floors have ceramic tiling. Ceilings are painted; kitchens, entrance halls and washing rooms have suspended ceilings which are smoothed with filler and painted. * - These examples are indicative, the developer has the right, if necessary, to replace these products with equivalent analogue.